As a new take on the hugely popular supermini, the Honda Jazz was launched. This is a stylish family car that looks particularly trendy after it’s upgrade and is perfect for getting around town and trips to rural locations. This car performs well and has a range of different models for you to choose from including the basic Honda Jazz S and the Honda Jazz SE Sport. 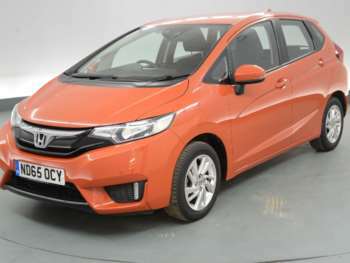 Here at RAC Cars, there is a variety of used Honda Jazz models to explore, so that you can find the perfect car from an approved dealer in your area. Honda’s distinct styling is all over the Honda Jazz and it is just on the right side of quirky. Like all good family vehicles, the used Honda Jazz offers plenty of flexible seating arrangements, thanks largely to the fact that the designers moved the fuel tank to make the rear seats easier to move. You also get plenty of luggage room and both first and second-generation Jazz ranges benefit from a roomy interior with plenty of nooks and cubby holes to keep all your things. You can also count on a Honda Jazz to be reliable, safe and economical. Gear changes feel smooth and the steering is responsive in both generations of the Jazz, making for an enjoyable driving experience. If you choose a used Honda Jazz with the i-Shift gearbox, then you can have either clutchless manual or full automatic operation at your disposal, which is a nice touch.